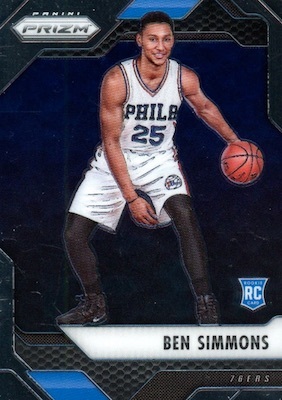 His path to NBA stardom took a little longer due to injury, but Simmons trusted the process, and the many Ben Simmons rookie cards made up for lost time thanks to his impressive rookie campaign. The first pick in the 2016 NBA Draft saw Ben Simmons taken by the Philadelphia 76ers after one year at LSU. While a preseason injury stopped his rookie season before it had started, it did not slow the Ben Simmons rookies cards in 2016-17 sets. However, his rookie season on the court occurred in 2017-18. 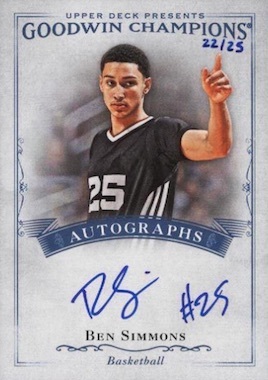 One major difference for Simmons compared to most other hyped rookies is that he has an autograph exclusive with Upper Deck. Becuase Panini has the only pro card license, collectors must visit them for Ben Simmons NBA cards but need Upper Deck sets for Ben Simmons autograph cards. UD also has an autographed memorabilia exclusive for Simmons. 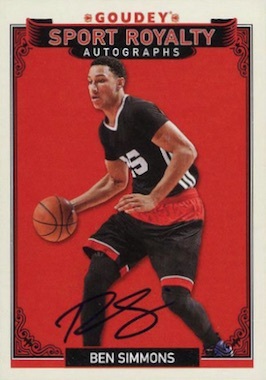 This is certainly not ideal from a collecting standpoint because it means there are no standard NBA rookie autograph cards for Ben Simmons. 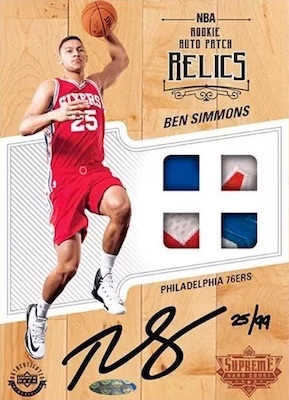 Mixing in both his Upper Deck and Panini releases, the list below highlights some of the best Ben Simmons rookie cards. Most of these came in 2016-17 basketball products but there are some exceptions, which are noted. Think of this more like an honorable mention. 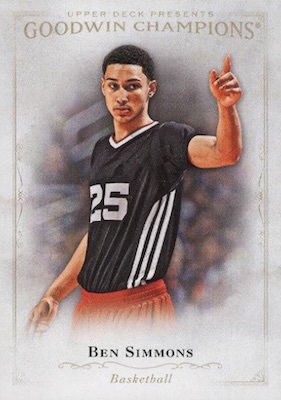 Although not technically a trading card, and released the year after his rookie season, this 5x7 collectible from 2018 Upper Deck Supreme Hard Court carries many attributes of a desirable Ben Simmons rookie card. Composed of game-used NBA court, the Rookie Auto Patch Relics piece features event-worn memorabilia and an on-card signature. And the word "rookie" is even printed on the front. Simmons has several different options in the set, including both signed and unsigned pieces. 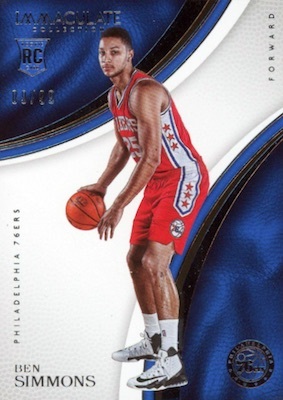 One of the earliest Ben Simmons rookie cards didn't even come in a basketball set. 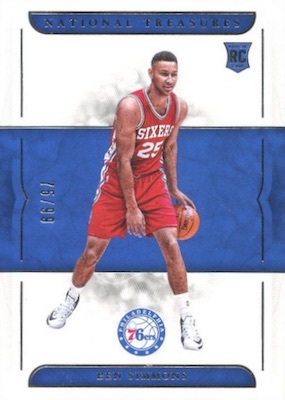 Released just a few weeks after he was drafted by the 76ers, the 2016 Upper Deck Goodwin Champions short print is a very tough pull at 1:1,280 packs. 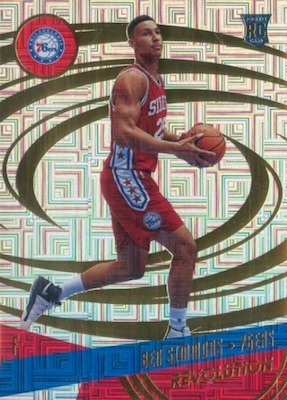 Just like all the UD cards for Simmons, NBA logos are not an option. The first of several parallel-heavy options on the list, the main card for Simmons in 2016-17 Revolution is further enhanced via the fanciful Astro, Fractal, Galactic, Infinite, Cosmic (#/100), Sunburst (#/75), and Futura (#/25) parallels that change the background design. While the base is affordable, the parallels, like the Infinite version below, push values higher. One could easily argue that the Ben Simmons rookie in 2016-17 Prizm is his most popular choice. The base card is still an option for budget collectors and high-end fans can chase the rainbow of parallels. 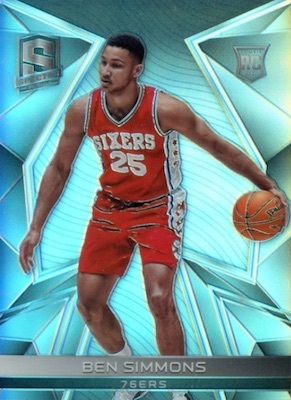 Buoyed by the various colorful parallels, the 2016-17 Spectra Ben Simmons is a tougher find given that the 10-card boxes only have three base cards. It's also worth noting that the Neon Green die-cut version, numbered to 25, has a different image. 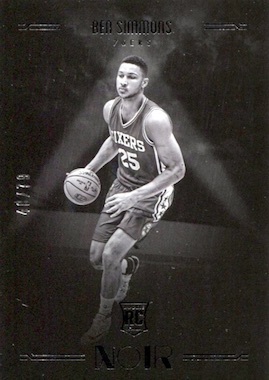 Contrasting nicely, 2016-17 Noir brings collectors two different Ben Simmons rookie cards in the base set. Although both have just 79 copies, they are easy to distinguish because one features a black-and-white image and the other is in color. An attractive rookie card, 2016-17 Impeccable is not at the same level as Immaculate or NT, but perhaps it should be. The dual images work well in the premium design and the print run is capped at just 99. Like Impeccable, the Ben Simmons base card in 2016-17 Immaculate Collection has only 99 copies. But a strong legacy in the hobby pushes values a bit higher. 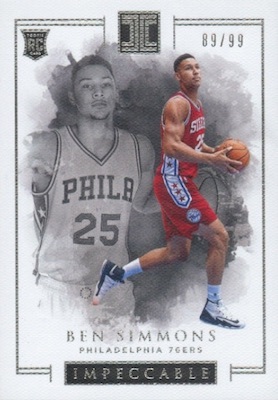 Joining the Upper Deck short print at the start of the list, 2016 Goodwin Champions also has limited Ben Simmons autographs. The main Autographs insert features a "#25" inscription with a matching print run. He's also in the Goudey Sport Royalty Autographs line as part of Group D, which averages 1:3,168 packs overall for the five subjects. 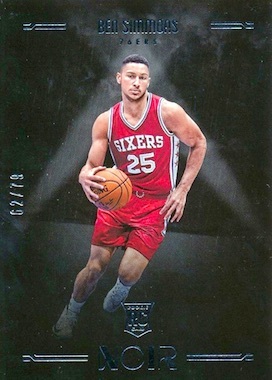 Despite having the same print run as Immaculate, and even working in the same contrasting blue and red colors, 2016-17 National Treasures holds the spot for top Ben Simmons rookie card without an added feature. The crisp design looks very nice and the NT brand has long been a basketball favorite. A surprise on many levels, the Ben Simmons Exquisite Rookie Autograph has enjoyed tremendous interest. Found as an unexpected "Easter egg" insert in 2017 Goodwin Champions, the expensive card taps into the Exquisite magic even without an NBA license. 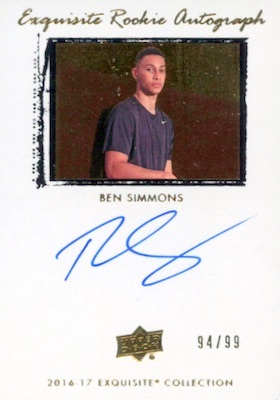 Because Panini can't issue Simmons autographs in their products, this may be the top rookie card for many collectors. And that brings us to 2016-17 Flawless. 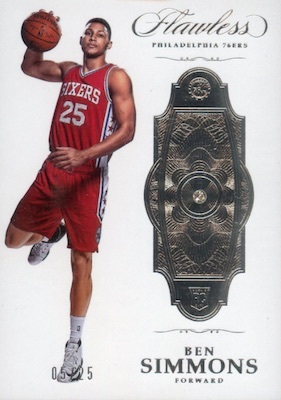 Numbered to only 25 copies and featuring an embedded diamond, this Ben Simmons rookie card is tough to beat. It's also tough to find. If you manage to locate one, expect to pay well into the thousands. BEN SIMMONS 2016 17 DONRUSS OPTIC ROOKIE RC #151! 76ERS! 2016-17 Panini Select Ben Simmons RC SILVER Prizm Lot x3 - BGS 9.5 Gem Mint x3! !